Do you know what job I’m most looking forward to over the Spring holidays? It’s decluttering my daughter’s bedroom. My goodness, she’s an expert at accumulating stuff. From books to arts and craft creations, through to toys and even outgrown clothes. “But why can’t I keep all this stuff?” My daughter plaintively asks. It’s a bit like sorting through your email inbox. Did you know the average office worker receives 121 emails a day? You know what it’s like to face a mountain of emails. But if you’re a marketer, you’ll also recognise that with an ROI of approximately £30 for every £1 spent, email is an effective marketing tool. So if email forms part of your marketing strategy, how can you ensure your content survives your recipient’s instinct to declutter? First off you need to write subject lines that entice recipients to open them. Because 33% of email recipients open emails based on the subject line alone. 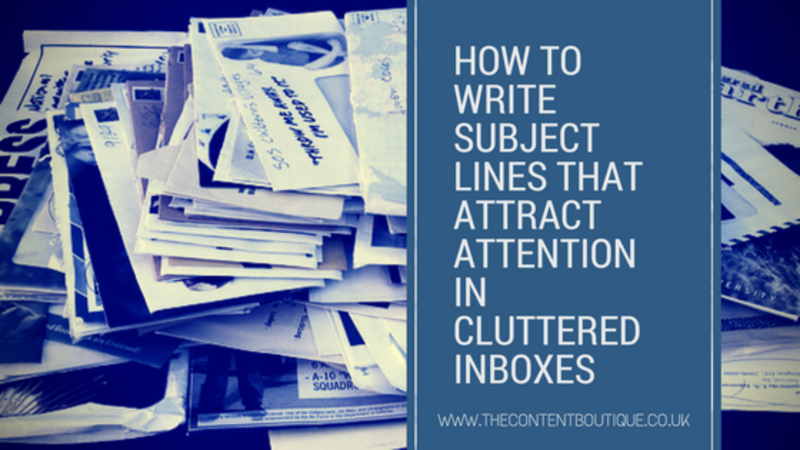 Allow me to explain how you can write subject lines that cut through the clutter. My decluttering strategy starts with a black bin liner. Anything without apparent value I quickly bin. People do the same with their email inboxes. The days of mass emailing are over. Email marketing campaigns must start with useful and relevant content. We open 53% of emails on mobile devices first. With this in mind, email writers must remember the average mobile screen only fits four to seven words. So when writing subject lines, keep them to a maximum of 50 characters. By the same token, make it easy for readers to understand and grasp your message quickly. Use clear and concise language. Declutter expert Marie Kondo tells us unless items spark joy in our heart then we should get rid of them. Address your audience, who they are and where they are, and you’ll have 26% more chance of getting your emails opened. Better still, speak directly to your readers by using the words ‘you’ and ‘your’. In short, my Spring declutter forces my daughter to decide what is actually important to her. I’m always interested in hearing about email marketing strategies. So do let me know if you’d like help writing email subject lines.